Valves are nearly linear, with a rounded headpole and narrowly rounded footpole. The axial area is lanceolate and relatively broad. A stigmoid is absent. The raphe is lateral and straight. The external proximal raphe ends are expanded and are placed close to one another. The external distal raphe ends are deflected in the same direction. The internal proximal raphe ends are sharply recurved and distinct. The central nodule is thickened and distinct. Striae are radiate, becoming nearly parallel at the headpole and more strongly radiate at the footpole. The specimens shown here are from the type slide. 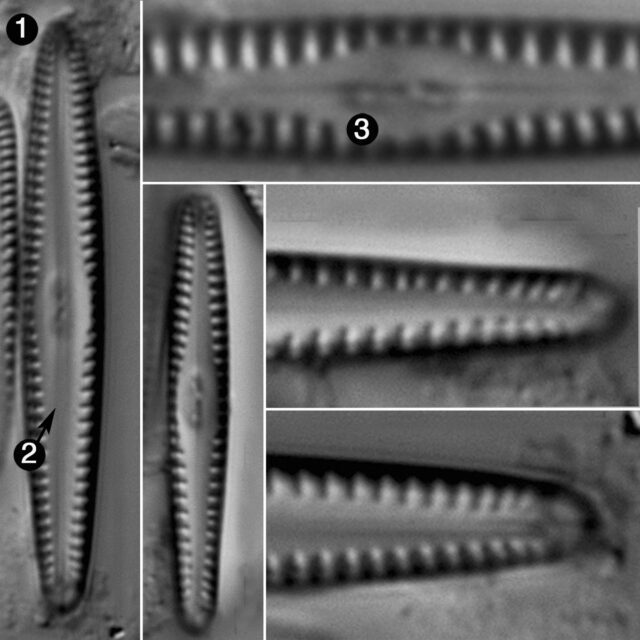 Gomphonema apuncto appears to be a rare taxon, restricted to rivers of the southeast states. Many of the records of G. apuncto appear to be misidentifications. This taxon may be confused with small valves of G. christenseni and perhaps other, as yet undescribed, species. Gomphonema apuncto appears to be a rare taxon in rivers, restricted to the southeast states. In the original description (Wallace 1960), it was described from the Flint River, Georgia. That publication also reported it from the North Fork of the Holston River, Smyth County, Virginia. Valvis angustis, sublinearibus, medio paullo tumidis, apicubus obtusis, 15-28, μ longis, 4-4.5 μ latis, striis abbreviatis, marginalibus, 13-15 in 10 μ, radiantibus. This species is very similar to Gomphonema tenuissimum Fricke, A. Schmidt's Atlas, pl. 248, fig. 7, 1904, except that G. tennuissimum has a punctum or stigma, which is lacking in this species. Since the absence or presence of this stigma is the character on which Grunow founded his subgenera, it seems more feasible to make this a new species rather than a variety of Fricke's species. In the collection from which the type slide was made, this species occurred as an almost complete dominant. In other collections from the same station where it occurred with less frequency, Anomoeoneis exilis (Kütz.) Cl. and Achnanthes minutissima Kütz. were the dominants. It also occurred in the North Fork of the Holston River, Smyth County, Virginia. Valves are narrow and linear, 3.0 - 4.1 µm in width. The axial area is relatively wide. A stigmoid is absent.